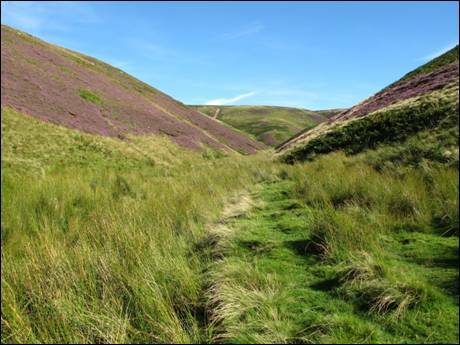 It starts its journey where the Rowhope Burn rushes into the River Coquet at Slymefoot and was referred to on General Roy`s 1775 map of the area as, `The Clattering Path`. 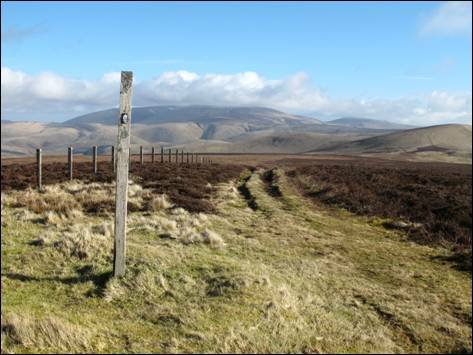 These days, this ancient cross border drove road is named on the Ordnance Survey map as, `The Street` and provides an excellent high level walking route to a variety of destinations on both sides of the border. Utilizing this delightful green track at the start of your day, this walk is a rollercoaster ride which visits the valleys of the Carlcroft, Heatherhope and Rowhope Burns as it crosses the windswept tops of Swineside Law, Mozie Law, Windy Gyle and Loft Hill whilst clambering over one of the strangest locally named hills in the whole of Northumberland. Along the winding and undulating way, loaded down with outstanding views, you will experience solitude of a kind which is definitely in short supply in this tiny speck of an island we choose to call home. You may even bump into a feral goat or two as you wander happily along the county`s `fractured edge`. So, dust off your boots and let the good times roll. 1. In his 1903 published book, `Upper Coquetdale Northumberland It`s History, Traditions, Folk-lore and Scenery`, David Dippie Dixon described the spot where you will start your walk as the, “Rowhope burn, having been joined by the Trows burn, here issues between the steep slopes of the Slyme and Barra Law and mingles its waters with the Coquet at Rowhope-burn-mouth”. In other words, park your car on the small, Tarmac-covered area at Slymefoot, otherwise known as White Bridge or Trows Road End (GR NT859114). Once you have stopped the engine, stepped outside and have taken a deep breath of the fresh morning air, a quick look at your map of the area will reveal that the spelling of Barra Law, which at the beginning of the day casts a deep shadow over the parking area, has now been amended to, `Barrow Law`. Such is the march of time. The narrow road which runs alongside the Rowhope Burn serves the nearby farmstead of Rowhope, which you will pass on your return route, and the more remote farm of Uswayford, which you will not pass. The two storey farmhouse at Trows, which is located between the two, is currently unoccupied. Prior to the bridge being constructed in the late 1930`s, the burn was crossed via a ford which can still be seen (and used) just before the burn joins the River Coquet. Now that you are primed for the day ahead, cross over the bridge and then immediately on your right, next to a five bar gate, cross over the small step stile. You are now on The Street, a track you will follow for the next 3.5 kilometres (2.2 miles). 2. Keeping the post and wire fence to your left, follow the twin indentations of a quad bike up the steady grass-carpeted slope, pausing once or twice to admire the view of the farms of Windyhaugh and Barrowburn slowly diminishing in size behind you. As the slope begins to ease, immediately before reaching a facing step stile, look over to your right to see the huge bulk of Windy Gyle dominating the spectacular scene, with the buildings of Rowhope and Trows nestling at its feet. This is your return route. Now cross over the stile and, with the fence still on your left, continue to follow the track as it makes an almost ninety degree turn to the right and then begins the slow, easy climb towards Hindside Knowe. The word `knowe` hereabouts means, “small rounded hill or shoulder”. Continue to and then cross the next facing stile (GR NT849118). You will now have the fence on your right hand side although your boots are still firmly planted on The Street as you continue upwards in a generally north westerly direction passing through a five bar gate as you go. Quickly after leaving the gate behind, make sure to keep close to the fence rather than slavishly following the track as you make your way around The Slime and the minor top of Bought Law. The word, `law` simply means, “hill” and is common on both sides of the border. The views towards the border are extensive with, on your right, the beautiful valley of the Rowhope Burn, picturesque in the extreme and, on your left hand side, the lonely valley of the Carlcroft Burn. Ahead, slightly to the left stands shapely Swineside Law, a small detour on your journey to the border. But first in a wee while, you will pass through another five bar gate (GR NT840127). 3. Continue forwards for roughly another 350 metres after the gate, to the point where a small stile crosses the fence to your right. Once you have arrived, you will need to make the short there-and-back-detour, via a faint track on your left, to the flat, grass-covered top of Swineside Law. 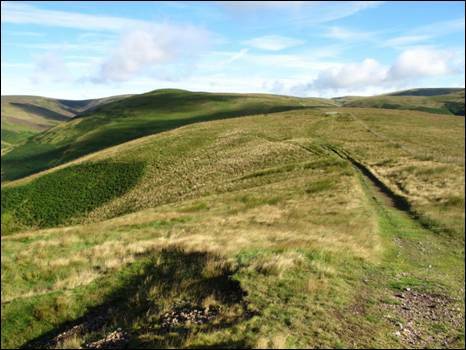 Standing a decent 457 metres above sea level this hill, which incidentally offers excellent views of the surrounding hill country, is often seen but, seemingly, rarely visited by passing walkers whose sole intent is to summit the iconic Windy Gyle. You have other, delightful, `fish to fry` before you will be sitting on top of that particular hill. Once back on The Street, continue your journey by turning to your left, contouring the slopes of Swineside Law and then descending to the saddle immediately before the steep climb up Black Braes. There you will be met face to face by two five bar gates and a small step stile (GR NT837135). Go through the left hand gate and follow the faint track as it bends to the left until you are parallel with a circular sheep stell slightly downhill. 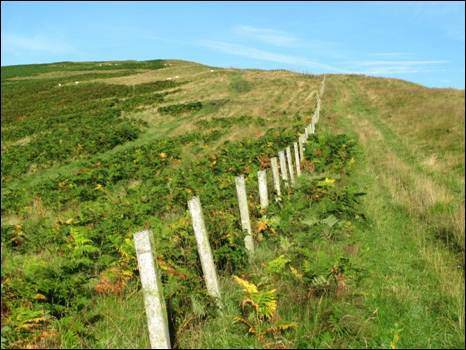 Now go diagonally right around the lower flanks of Black Braes to eventually pick up a thin path which runs through a patch of cropped heather and alongside a fence to your left. This fence encloses a section of young native trees which line the banks of the fledgling Carlcroft Burn. This short stretch of path can, at times, be rather wet so take your time. When the fence comes to a halt at Carlcroft Hope (GR NT832138) you will need to cross over the Easthope Burn, a watercourse which may possibly be audible but will unlikely to be visible and which arrives from your right through a narrow V-shaped valley. Be sure to watch where you plant your boots if you are keen to avoid `taking an early bath`. This is a magnificently enclosed area of land which is at its very best when the heather is in full flower and the air is heavy with the sweet smell of honey. 4. Once safely on the other side of the burn, head a short distance to your left to reach the base of the unnamed hill which rises to your right. You will see a thin trace through the heather and bracken covered slope. This is your steep, upward route so, after a quick swig of your high energy drink, head uphill slowly picking your way to the grass covered, 465 metre high top of this unnamed hill (GR NT830141). This fine, shapely lump, caught between the Easthope and Westhope Burns, is essentially a spur of the higher, better known Mozie Law and is not individually named on the Ordnance Survey map. It most certainly deserves better. Luckily, the locals thought so because to generations of Upper Coquetdale folk this hill has been known as, `The Devil`s Mother`s Grave`. It is also a terrific grandstand from which to enjoy the immediately surrounding countryside. 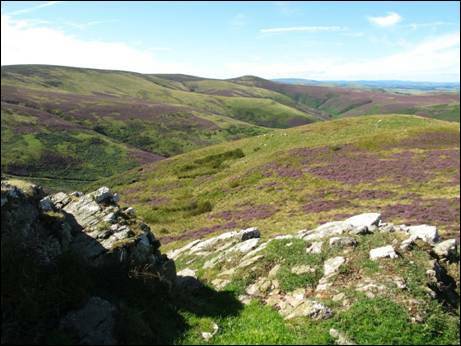 Take time to savour your visit, it really is a very special place and one which is frequented by the shy, wild goats that roam the Cheviot Hills. Keep your eyes peeled. When you are ready to leave this quiet spot, continue across the top and descend the steep, pathless slope to the small narrow saddle. Ahead, looms the muscular flank of Mozie Law, clothed in heather-flecked grass and with a hint of a quad track heading upwards. Begin your sharp, breath-stealing climb and with a bit of luck you will quickly locate the helpful track which soon makes a relentless direct line towards the hidden border fence. Be sure to look behind you as you labour uphill so as to enjoy, albeit briefly, the fantastic view over the top of the hill you have just left behind towards Swineside Law, Tindale Law, Shillhope Law and the dark green hill-covering mass of Carshope Plantation. 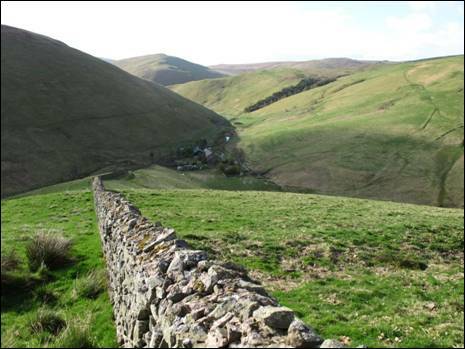 Eventually, and perhaps with some physical relief, you will reach the post and wire border fence and the paved path of the Pennine Way as they run hand in hand towards Kirk Yetholm in one direction and Edale in the other. You will need to turn to your right. 5. When Alfred Wainwright passed this way in 1965 making notes for his soon to be published, `Pennine Way Companion`, he remarked that, “the route follows the fence exactly”, adding, “a clear path is forming on the English side of it and this is likely to become more marked with usage: the peaty surface is slippery and soggy after rain----which means it usually is”. At that time, the route had just been officially opened and since then thousands of pairs of boots have trudged past this spot. Fortunately for you, an erosion-protecting paved footway now leads you to your next port-of-call, Mozie Law, little more than 250 easy metres away. It is worth noting that in 1965 the Ramblers Association had erected a series of signs along parts of the Pennine Way, a guide perhaps for navigationally-challenged walkers, signs which Alfred Wainwright said were, “thick on the ground in this section”, with the one on Mozie Law being, “the last of a first set of 12, the next set of 12 being met beyond Windy Gyle”. Unsurprisingly, considering the presence of the fence and the development of the path alongside, he considered that the signs, “not really necessary”. The top of Mozie Law (GR NT828150) is marked with a pole approximately six feet high bearing the acorn National Trails symbol. The panorama on a clear day is without peer especially straight ahead to the Cheviot heartland which is filled with a plethora of eye-catching creases and crumples. 6. Time now to leave behind the navigational security of the border fence and to step across this flimsy international boundary on to Scottish turf or, more correctly, Scottish heather. So, turning to face the fence put your best foot forward and head into Caledonia, keeping straight ahead until you reach a faint track in a small dip in the hillside. Turn to the left and follow the track as it begins its winding journey down Hard Rig. The track is clear to follow throughout with superb views reaching out across the Scottish borderland. In time, the Heatherhope Valley will come into sight with the now redundant reservoir twinkling beneath a sparkling Cheviot sky. Hills roll across the lonely skyline, long valleys stretch deeper into Scotland, hill farmers go quietly about their business much like they have done for generations. Solitude rules! As the track begins to close in on the valley, you will spot way below an old railway waggon now spending its hard earned retirement as an animal feedstore (GR NT815159). There are a number of these old waggons dotted about the Cheviot Hills, on both sides of the border. How many will you spot on this walk? 7. 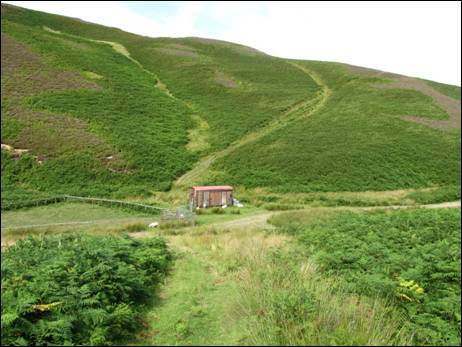 You are now standing beside the Heatherhope Burn at a height of some 256 metres above sea level and, to your left, you will see a number of sheep pens. You continue your journey by turning right and following the burn downstream, passing as you slip between steep-sided hills, a hut on your right. You will also cross the shallow burn on two occasions before you reach the point where the track splits in two (GR NT815163). Straight ahead looms conical Sundhope Kipp a projecting spur of Greenbrough Hill which once housed an elliptical-shaped hillfort enclosing fifteen circular and oval huts. The hillfort would have been virtually impregnable on three sides with the only means of access being from the higher ground of Greenbrough Hill. To your right, the track heads past a circular sheep stell towards the bulk of Mid Hill whilst, to your left, the track leads to the Heatherhope Reservoir. You now disregard both spurs of the track as you have reached the turning point of the walk. Your route turns sharp right up the steep gravel track which, after rising rapidly at first, begins to climb more gradually over Phillip Shank with excellent receding views back towards the Heatherhope Valley. This is a delightful stretch of the walk over primarily wide reaching grasslands scattered with patches of heather and, after just less than one mile of walking you will reach a small, unnamed rocky outcrop (GR NT826160). At a height of 479 metres this cairn-capped spot enjoys an extensive panorama in all directions and makes an absolutely perfect picnic place. It would be rude not to linger here over a tasty sandwich or two as you consider the next part of your walk. 8. Now refuelled, you have energy to burn and, with less than 500 metres to the gate back onto The Street, it is time to go. Rejoining the track, turn right and before you have time to break into song you will see ahead a small gate. Turn diagonally left, go through the gate, turn right and continue your journey towards the border. On your way you will pass a three fingered signpost with one finger pointing northwards to Calroust in the Bowmont Valley and further on another, somewhat incongruous, sign more appropriate to an urban setting than here in the middle of nowhere. You will, no doubt, draw your own conclusions. Eventually, when you reach a five bar gate (GR NT836154), turn left on a faint track, which becomes clearer as you travel forwards, ensuring that you take the right spur when the track splits in two. At the small gate in the border fence on your right, go through and step back into England and onto the Pennine Way. Turn left. 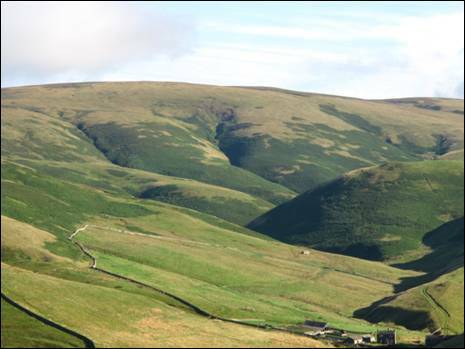 You are now walking along one of the finest stretches of this epic route over the backbone of England with heart-stopping views down the Rowhope Burn and across Windy Rig towards Windy Gyle. 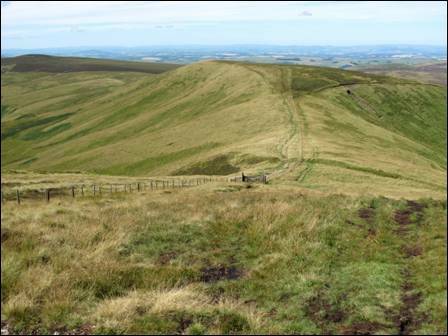 Continue over the sweeping grassy ridge, quickly crossing back into Scotland via an interesting stile before completing the final climb on a peaty path to one of the area`s best loved hill, Windy Gyle. Standing here not long after the Pennine Way had been officially opened in 1965, Christopher John Wright, author of the book, `A Guide to the Pennine Way`, said that, “Windy Gyle affords a splendid view of the English side of the hills, while the whole of the Border ridge is in view to the `stone men` on Auchope Cairn”. The author, it seems, was not a man to wax lyrical. The summit is crowned with an enormous Bronze Age burial cairn, retrospectively given the handle of Russell`s Cairn in memory of Sir Francis Russell, one of the Wardens of the Marches who died near here back in 1585, and a bridal-white triangulation pillar. 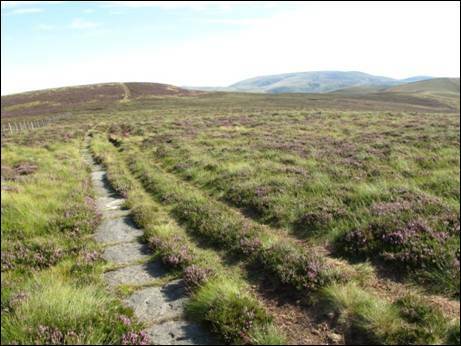 At 619 metres above sea level, this is the fourth highest of the Cheviot Hills with the actual summit lying on Scottish turf. Yes, and by the way, the view is absolutely stunning. Sit with your back resting on the triangulation pillar and soak up the high level view, for the remainder of the walk is virtually all downhill although you will claim one final top before the valley is reached. 9. Once you are ready to leave this elevated spot, with your back to the triangulation pillar, face the border (southwards) and then head diagonally right on a thin path (the centre of three paths, the one not signposted), to reach the post and wire fence and a small stile across it. Keep the fence on your right and soon you will reach a slightly sunken track and a gate on your right (GR NT854150). Whilst this track is not named on the current Ordnance Survey map many earlier maps had referred to a track in this approximate location as Maiden Cross and, indeed, Maiden Cross was one of seventeen border crossings listed in a state paper of 1543. It is a pity that the Ordnance Survey has not recorded this name on their map, a step which would have kept this ancient name alive and well. At this point, the track also marks the border between Scotland, where you are now standing, and England, on the other side of the track. It is easy to think, when you happily crossed the stile now behind you that you had stepped back into England. A close examination of the map will tell you otherwise. So, now take that important step and cut straight across the `Maiden Cross` track and then, with the fence firmly on your right, continue forwards over potentially boggy ground. There is a track of sorts which heads parallel with the fence and you might just find that this is, in the main, your best option. Otherwise, pick what you feel is the best way forwards always keeping in close contact with the fence. Eventually, you will reach drier, grass-covered ground as the gradient jogs downhill. Stay with the fence until the saddle is reached when you will find it easier to cross over to the other side and to continue your journey upwards towards the top of Loft Hill. Finally, after a little bit of climbing, you will see, on your left hand side, a small step stile which, in order to reach the actual top of Loft Hill, you will need to cross. The top is unmarked so you will need to use your best guess as to where this lies (GR NT849131). Standing at a height of 450 metres this lonely and, perhaps, little-visited hill enjoys good views. Now return to the fence and re-cross, continuing your way back to your car by turning left and heading gently downhill as far as a gate through the fence on your left. Go through and follow the track, which wanders across Sob Hill, until you reach yet another gate. Here you will enjoy a superb bird`s eye view of the farmstead of Rowhope, neatly tucked beneath the slopes of Hindside Knowe with Shorthope Hill dominating on the other side of the pencil-slim valley. Heads through the gate and, with the beautiful, almost perfect, dry stone wall on your right, stride out downhill to reach the private, single track road which runs alongside, at this particular point, the Trows Burn. You will cross another step stile en route. Now, you are almost home and dry, well perhaps not dry. Now turn to your right and follow the well-surfaced road, past the farm of Rowhope beyond which the Trows Burn merges with the Rowhope Burn and relinquishes its title. Back in the day, when peat was the fuel used by the occupants of farmhouses in the area, the folk at Rowhope cut their peats on Black Braes close to where you passed earlier in your walk. In 1959 a certain Joe Hutton moved here with his wife Hannah to look after a flock of some 700 sheep over 1000 acres of steep ground and, as well as being a shepherd, Joe was a gifted and internationally renowned Northumbrian Piper. In 1980 he was granted Honorary Membership of the Northumbrian Pipers` Society for his services to piping. As you quietly pass this peaceful farm perhaps you might just hear the ghostly echo of the Northumbrian small pipes sweeping across the high ground where Joe once roamed with his flock of sheep. Or perhaps it is just the farm`s generator that you can hear humming a tune as you wander by. The road, which now hugs the monkey flower-fringed Rowhope Burn, will soon lead you back to Slymefoot ready and willing to dip your tired toes in the fridge-cold waters of the delightful and tempting burn. You have deserved that at the very least. Slymefoot (White Bridge), Upper Coquetdale (GR NT859114), (GR NT849118), (GR NT840127), (GR NT837135), (GR NT832138), (GR NT830141), (GR NT828150), (GR NT815159), (GR NT815163), (GR NT826160), (GR NT836154), (GR NT854150) & (GR NT849131). Rose & Thistle Public House, Alwinton (limited), Clennell Hall (including caravan park). Otherwise a variety in Rothbury.